Fourth of July is just around the corner and you are likely eagerly preparing for all the fun festivities the day brings. How can you beat lounging in the backyard with a good BBQ, friends and family, and beautiful fireworks lighting up the night sky. Sure, it’s a ton of fun for us humans, but our furry friends probably don’t see it the same way. All the noises, crowds and commotion can be extremely stressful for them. 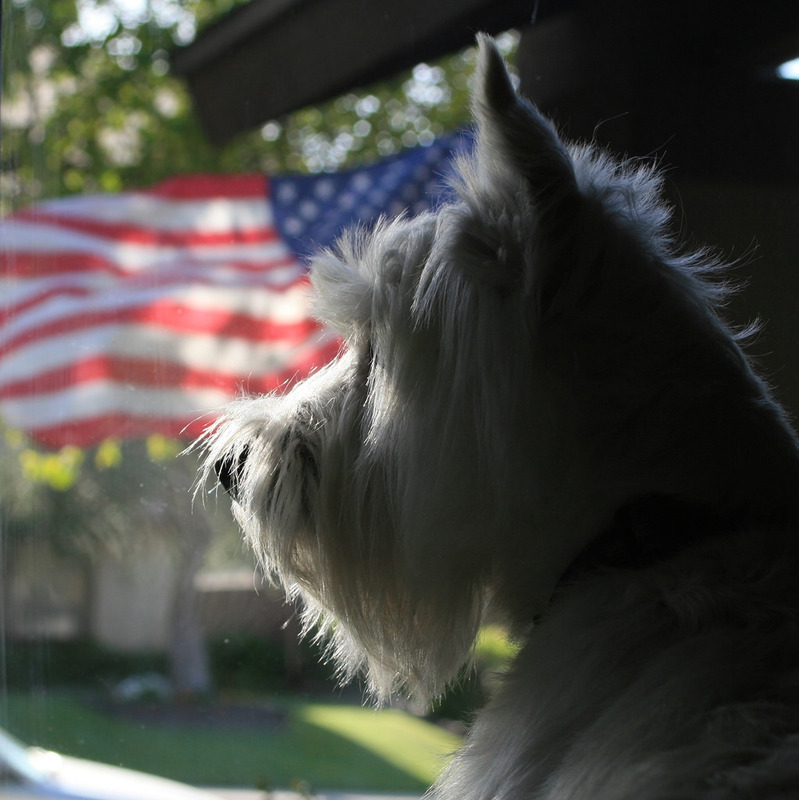 In fact, more pets run away from home on the Fourth than any other day of the year. Unfortunately, that also means that animal shelters experience the highest intake rates of stray and lost pets on the 4th and 5th of July. Even the most laid-back pets might be exposed to other dangers like alcohol or poisonous items. Be extra careful with your pets this Fourth of July and follow some of our tips below so your pet stays safe this year. Collar and ID tag. Check to make sure pet collars are secure and tags are up-to-date and readable. Microchip. Don’t have a microchip for your pet yet? Now is a great time! Call the micochip company to make sure the chip is registered and has your current information. Photos of your pet. If your pet does get our, you’ll want photos to make lost pet flyers. Have a clear body shot and face shot somewhere you can access quickly. Pet GPS. Several companies sell GPS transmitters designed to attach to your pet’s collar! The units are created to a size and weight suitable for dogs or cats (on a safety release collar of course) who are at least 10 pounds. Test the units out before the 4th so you’re familiar with how they function. Keep pets inside. Even if they are usually fine outdoors and have been fine in previous years, there is a reason so many pets end up in the shelters on the 4th of July. You never know when someone is going to set off a firework that will frighten your pet into bolting. Party time? Don’t take your pet to celebrations. Your pet is safest inside your own home. If you are having people over, lock your pets in a bedroom or in a crate so they cannot run away as people come and go. Ask guests not to let them out no matter what. Keep windows AND doors closed & locked.Startled pets have been known to push or jump through screens or even cracked windows. Keep doors to the outside closed during and after firework hours to prevent pets from slipping past you as you exit or enter. Pets can stay stressed for hours after the fireworks stop – don’t assume they won’t bolt even after the fireworks have died down. Turn on the TV or music. Play something with volume up loud enough to muffle firework noises. You do not have to blast the TV or radio to full volume, just loud enough to distract from other sounds. If you have a CD player, check out Through A Dog’s Ear — the Adopt-a-Pet.comstaff uses this for their anxious dogs and it really helps! Ignore their fear. Let them hide if they want, but don’t coax or pay attention to a pet exhibiting fearful behavior. You don’t want to unintentionally reward scared behavior. Also, if you are calm and relaxed, this can help your pet feel more secure. Anxiety remedies. Many pets respond dramatically to Rescue Remedy, sold at many pet or health food stores too, or at rescueremedy.com. If you know your pet gets dangerously distressed during fireworks, talk to your vet about possible short-term medication. Pets who ingest alcohol could become very intoxicated and weak, severely depressed or could even go into a coma. Death from respiratory failure is also a possibility in severe cases. Plan on taking your pet for a stroll during the day? You may want to protect your best friend from the hot sun or pesky bugs, but make sure you only give them items made for pets. Ingestion of sunscreen products can result in drooling, vomiting, diarrhea, excessive thirst and lethargy and insect repellents that contains DEET can lead to neurological problems. It might seem harmless to give your pet a special treat on the 4th, but any diet change, even for one meal, can cause severe indigestion and diarrhea. This is particularly true for older animals who have more delicate digestive systems and nutritional requirements. Even if your pet tolerates new foods well, there are some foods such as onions, chocolate, coffee, grapes, raisins, salt and yeast dough, that are always potentially toxic to companion animals. Never use fireworks around pets! Even if your pet isn’t stressed out by the lights and sounds, make sure you still keep pets away from the light shows. Exposure to lit fireworks can severely burn and cause trauma to the face and paws of curious pets. Even unused fireworks can pose a danger because many contain potentially toxic substances, like potassium nitrate, arsenic and other heavy metals. These are just some tips to get you started. Check out some of our past Fourth of July articles for additional resources.